Happily married and the mother of ten, Kathryn Sansone is centered, fit, organized, and beautiful. But Supermom? Absolutely not. Welcome to her club. "My life does not always go smoothly, and how can it when ten children guarantee constant change? But that's the point -- by keeping my roles in balance, I remain at peace and am more able to cope with everyday inevitable stresses," she says. 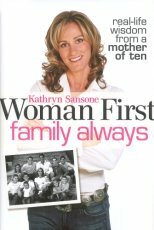 It's no wonder national television shows and magazines have featured Kathryn and that women continually ask her for advice on how she balances her roles as woman, wife, and mother. In this book she translates her everyday experience and strategies into simple yet life-changing tips that you can use. Along the way, Kathryn uses her signature warmth, understanding, and light humor to reach out to you and help you learn from her own real-life experiences.